Over the past 20 years movie and TV props have become less and less expensive to build, and far easier to fabricate compared to props of science fiction movies from the 1950s through the 1970s, especially considering the realism modern audiences demand. Just as Hollywood studios have used modern tech to make props easier and cheaper, even toy replicas look as good as their screen-used source material. 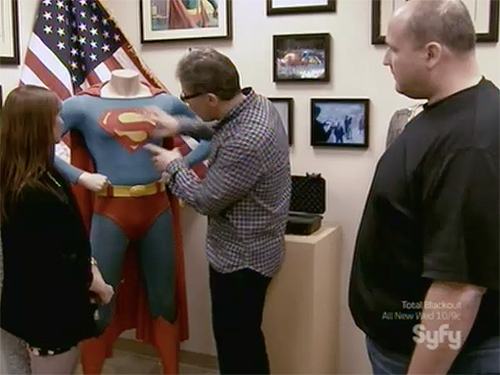 In the Star Trek Enterprise series, as an example, the studio found it cheaper in later seasons to use the licensed Art Asylum commercially available toy replicas on set. That’s right, the toy replaced the need for an original for the studio. 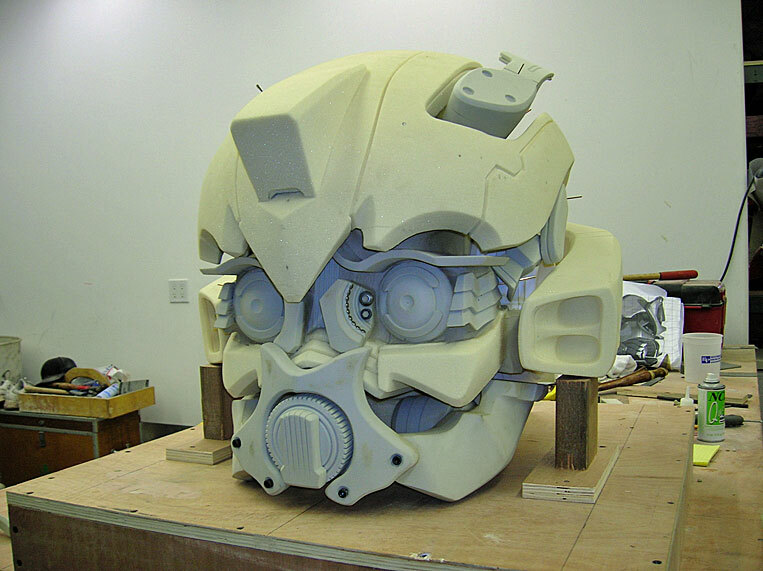 Now, many cosplayers create their own props via home 3D printers, a new idea for making movie props when we first discussed 3D printers here at borg.com back in 2011. The look of Star Wars props, the realism, the incorporation of real-world gadgetry in seemingly “real feeling” ways via adding on odds and ends from model kits and parts from electrician shops and auto garages (called “greeblies”) all goes back to Star Wars art designer Roger Christian, who created the look that would be replicated in every other science fiction movie created since. 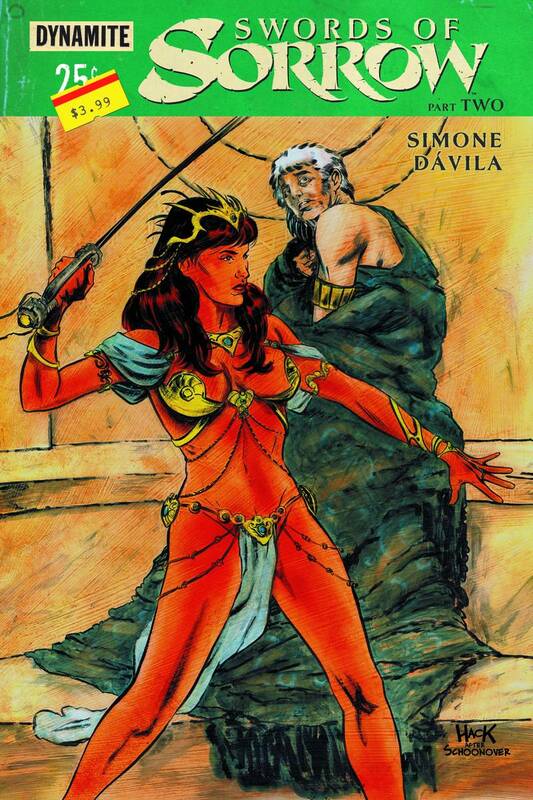 (Check out his autobiographical account previously reviewed here at borg.com if you missed it). 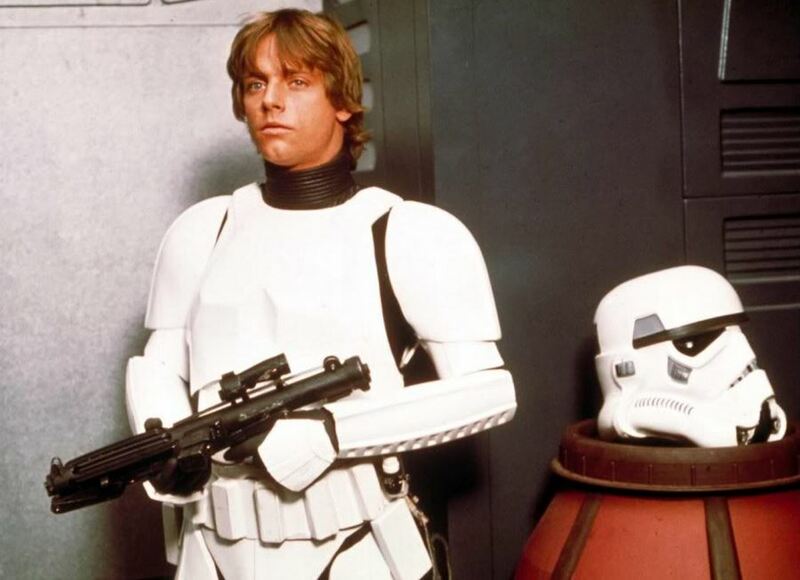 Just as many other props from Star Wars were based on real-world weapons, the standard Stormtrooper blaster, the BlasTech E-11, was built from a British-made Sterling L2A3 sub-machine gun. Last week Disney and Lucasfilm released information on a new line of Star Wars: The Force Awakens replica props and helmets from PropShop Studio Editions for sale at this link. These are high-end replicas taking advantage of current 3D scanning imagery, an idea I suggested in an article on 3D printing posted here at borg.com four years ago. The new line of Star Wars generated plenty of press because the new costume pieces are fairly pricey: a melted Darth Vader helmet is selling for $3,500 (limited to 500 units), a Kylo Ren helmet is $2,000, a Finn Stormtrooper helmet is $1,750 (limited to 500 units), and Poe Dameron’s X-Wing pilot helmet is $1,500. The props are similarly priced: Chewbacca’s crossbow is $2,500, Rey’s staff and lightsaber and Kylo’s lightsaber are each $1,500. Created using the original 3D digital data from the actual FN-2187 Stormtrooper Helmet featured in the film in combination with advanced digital manufacturing processes, and then hand-finished by a highly skilled artisan. The original blood marking has been laser scanned and projected onto this helmet, and a special paint effect process has been applied to identically recreate the surface texture pattern. 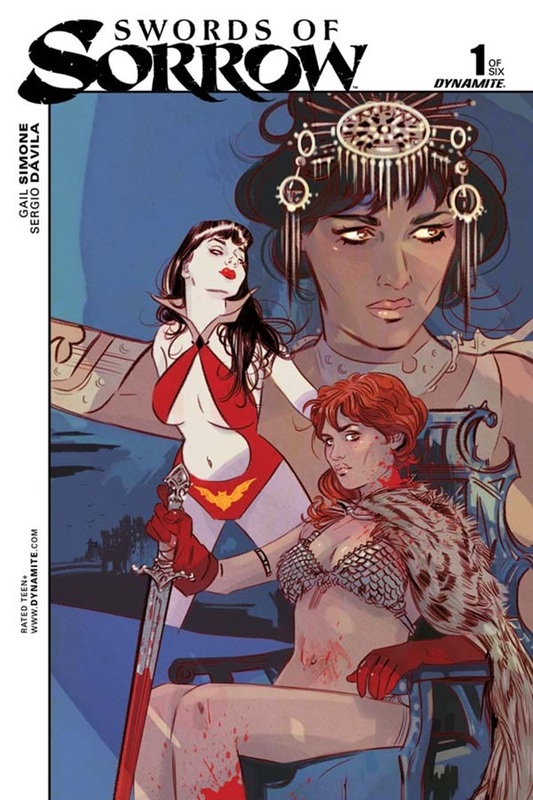 We previewed this week’s Julien’s auction here at borg.com last month. 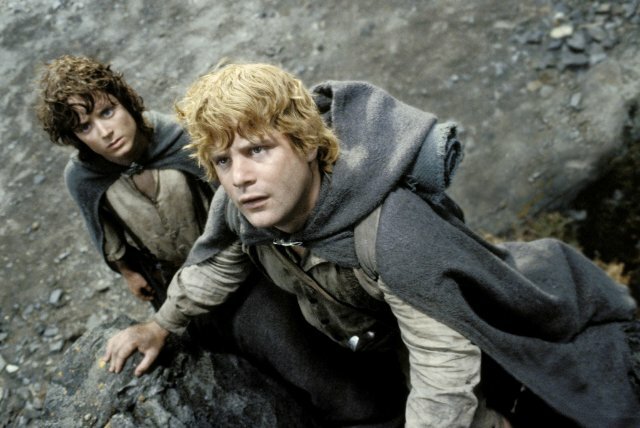 It could go down as the best auction of The Lord of the Rings props and costumes ever sold at auction simply from four of its offerings and it may be the only chance this decade to get your hands on props from the Academy Award winning films. 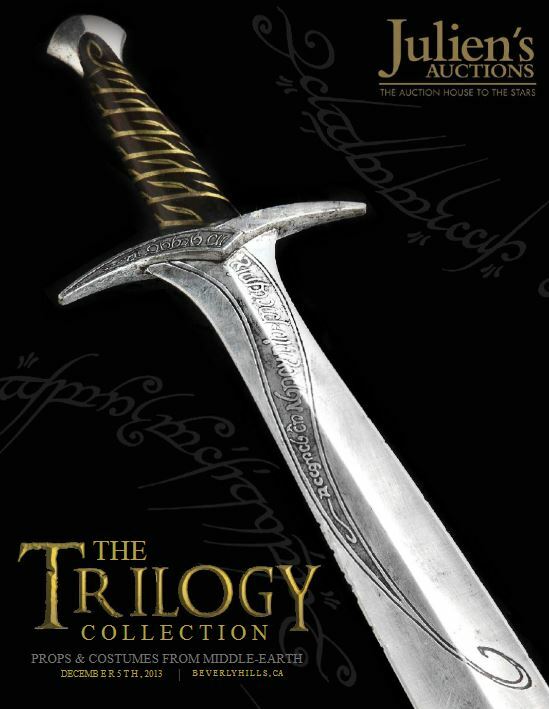 Called “The Trilogy Collection–Props and Costumes from Middle-Earth,” Julien’s is offering several items on the auction block this Thursday, December 5, 2013. The key items being auctioned belong to a group of screen-used props that were given away as part of a Hasbro Toys/New Line Cinema contest to promote the release of the third LOTR installment, the 2003 Academy Award winning best picture The Return of the King. 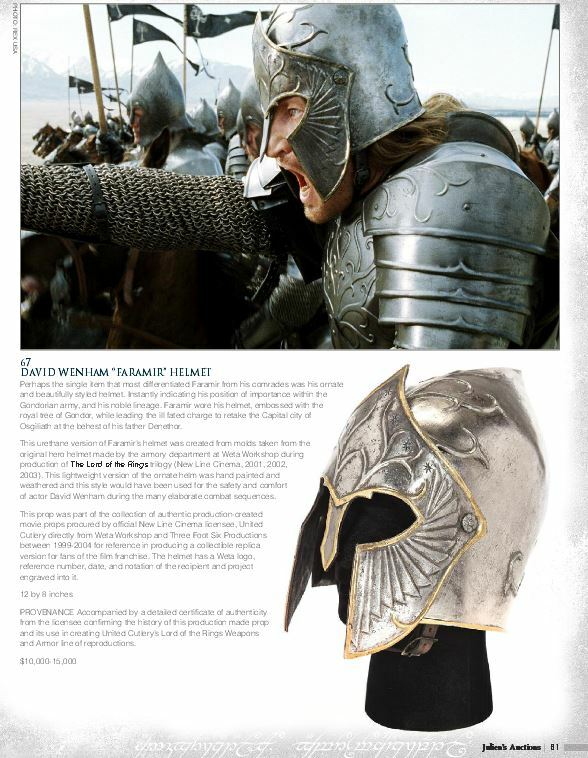 Described as “one of eight main character props used heavily in The Lord of the Rings,” look for Aragorn’s sword, Frodo’s “Sting” sword, Eowyn’s sword, and Gimli’s battle axe, each expected to fetch prices ranging from $30,000 to $70,000, with Frodo’s sword expected to sell between $100,000 and $150,000. 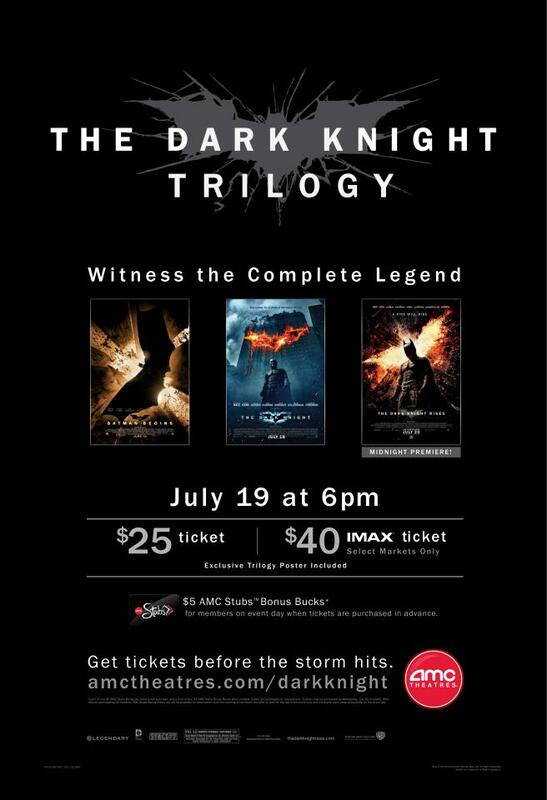 AMC Theaters’ newest marathon event is tonight, the Dark Knight Trilogy Marathon, and with more than 60,000 advance ticket sales it has already become the biggest selling marathon movie event to date. Starting at 6 p.m. and culminating with the premiere of The Dark Knight Rises at midnight, tonight is sure to be a big night for Batman fans. 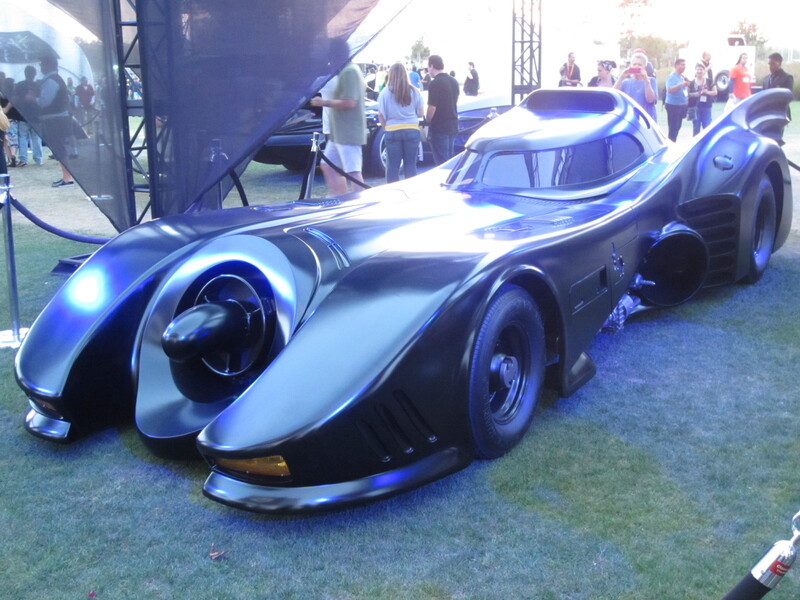 Until then, for your viewing pleasure and to get you psyched for Batman night, here is a gallery of all of the Batman cars–the Batmobiles–that have appeared on-screen, from the TV series in the 1960s to today’s bulky offroad vehicle, featured on the lawn between the Hilton Bayfront Hotel and the San Diego Convention Center last weekend as part of the Comic-Con festivities. The photos I took this weekend don’t do justice to these big, sleek, bad Bat-cars. First off, above is the original 1955 modified Lincoln that became the Batmobile driven by Adam West in the original Batman TV series. 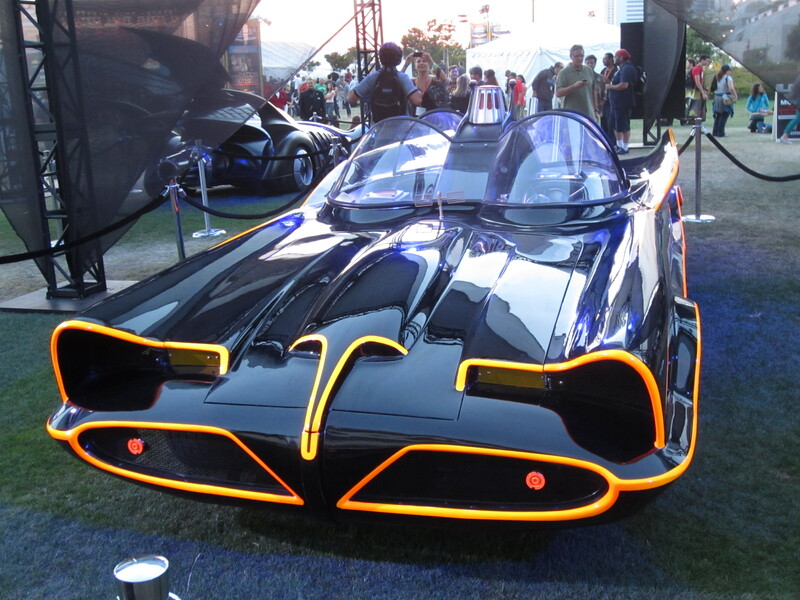 My favorite of them all and the best looking in person–Michael Keaton’s Batmobile from the 1989 Batman and Batman Returns movies. 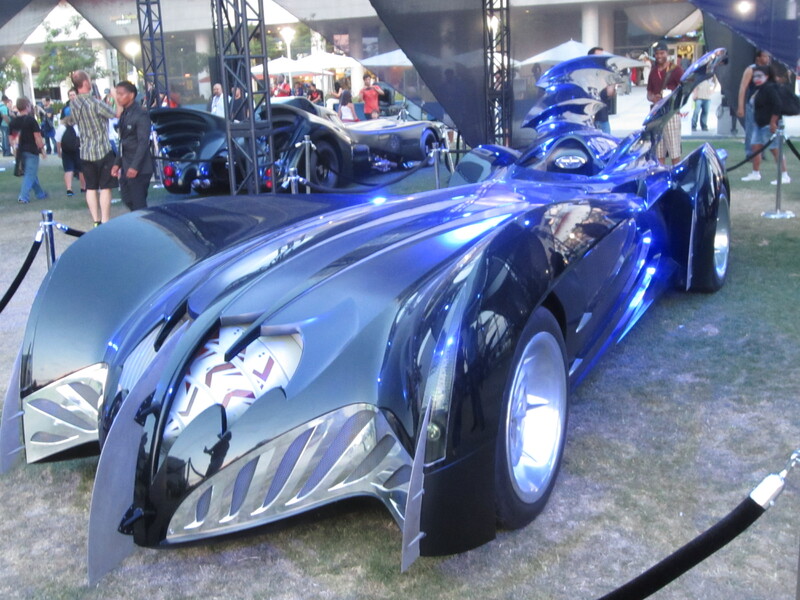 Val Kilmer’s Batmobile from Batman Forever. 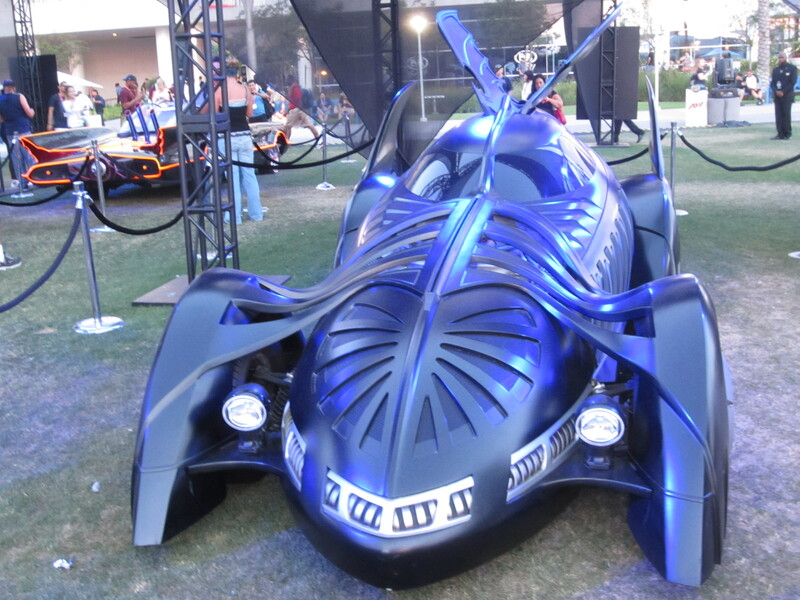 George Cooney’s Batmobile from Batman and Robin. 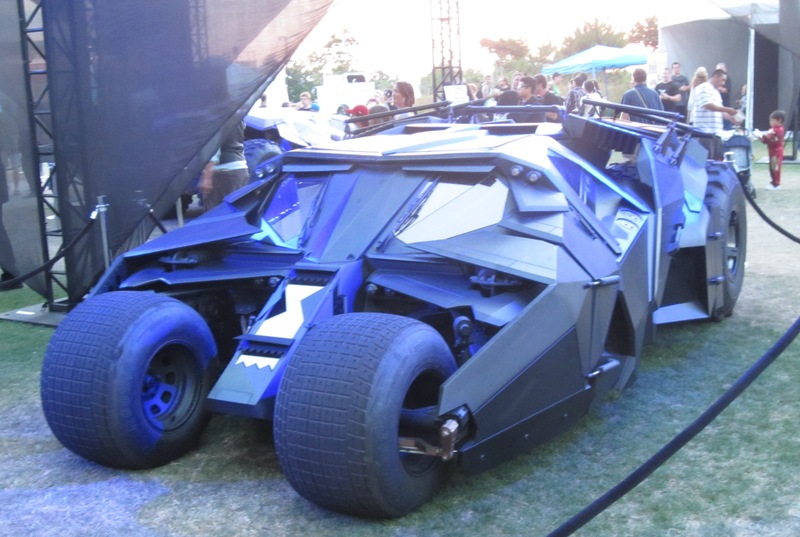 Christian Bale’s Batmobile “The Tumbler” from Batman Begins and The Dark Knight. 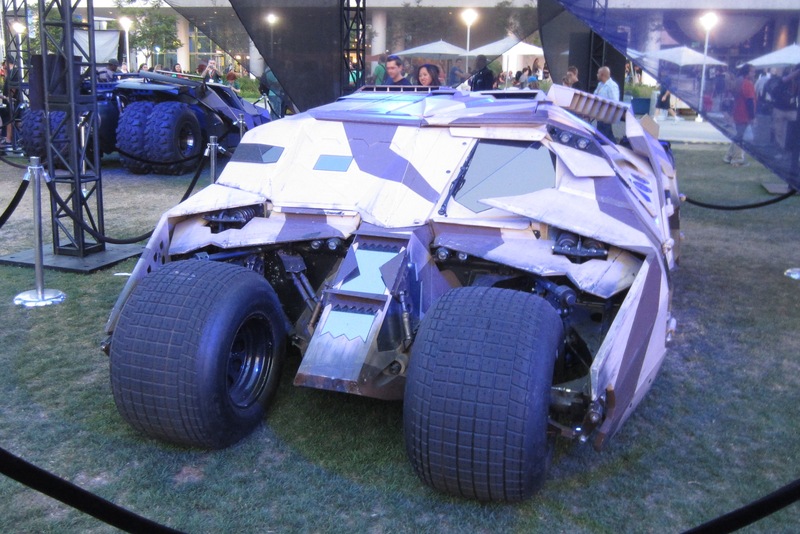 Christian Bale’s Batmobile from the new film The Dark Knight Rises. 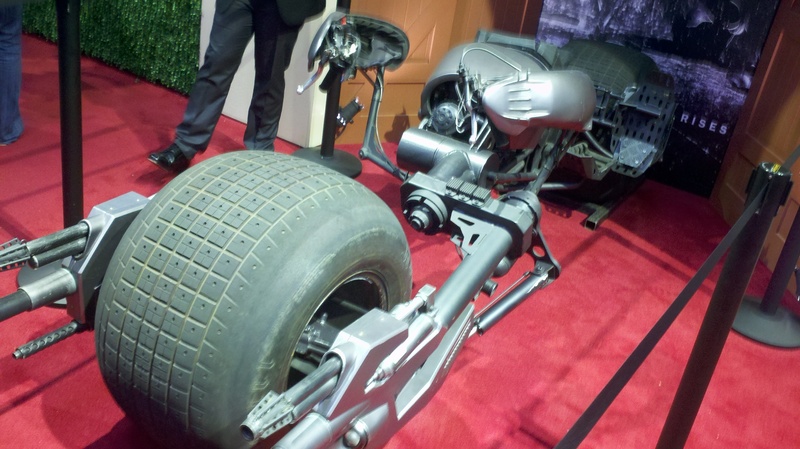 Christian Bale’s Batcycle from the new film The Dark Knight Rises, on display in the Comic-Con exhibit hall at the Warner Brothers booth. The cycle is a separating feature of the Tumbler. 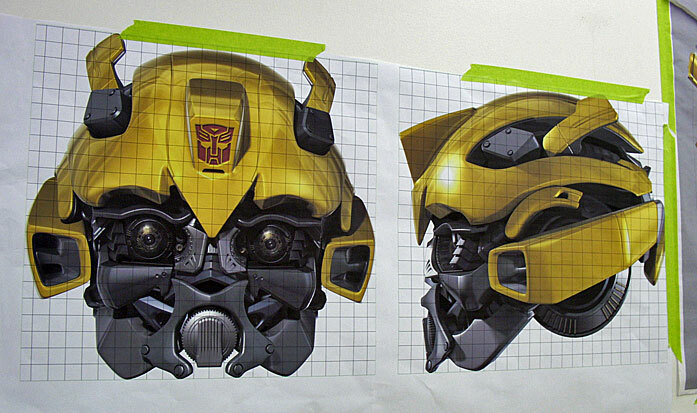 From Transformers to soft tissue… can we connect the dots? 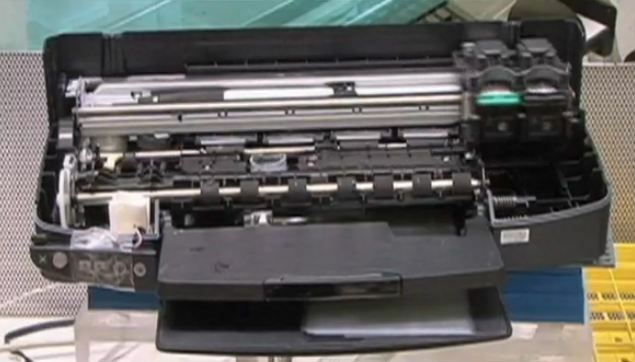 Remember not long ago if you wanted a home printer the then-big thing was the dot matrix printer, which printed dot letters on printer paper where you needed to then tear off the edges used to feed the paper from a roll? It wasn’t long until we all used desktop inkjet printers–what many of us still use today, and then good ol’ laser printers. But go back for a second and take a look at that inkjet printer. The future of medicine is in its design. Last June we reported on Maker Faire, a unique group of people all across the country that get together each year in different cities to discuss and share creative pursuits of any imaginable variety. Maker Faires last year featured makers of art using paint, wood, ceramics, makers of science using computers and elaborate machines, car builders, fashion and costume makers, chefs, flower arrangers, electrical engineers, writers–designers of every kind set up displays and performances showcasing the past, present and future of technology and ideas. It was and–at Maker Faires coming soon to a city near you–will be it’s own petri dish and melting pot, fertile turf to merge technologies to solve problems and think bigger. 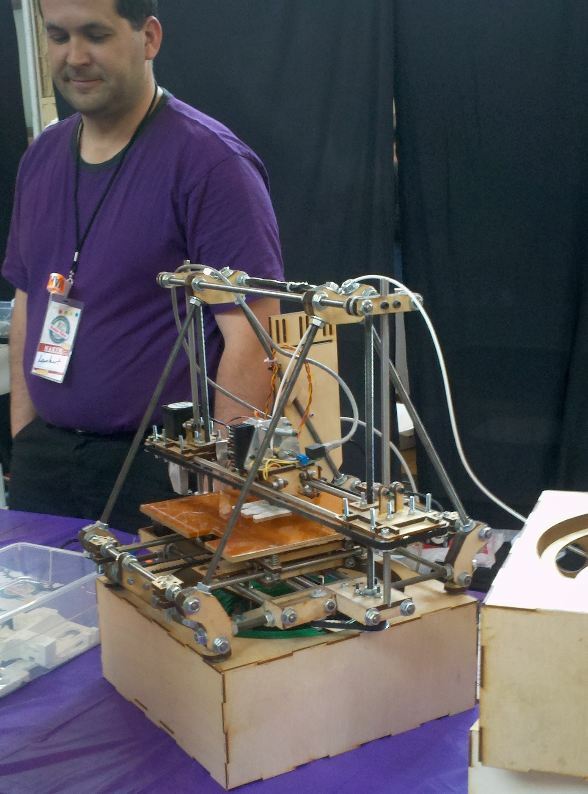 I was amazed at a display at the Kansas City Maker Faire showcasing the printing of 3D models using printers. These 3D printers not only printed objects that could be used in and of themselves–like components for fasteners in washing machines or circuit boards–they also printed the very components of the printer itself, more efficiently and quickly than something like injection molding. Yes, you can build–and buy at the Faire for a few hundred dollars–a 3D ceramics printer that would use instructions from your computer to take plastic thread and melt it into various components that could be assembled for you to make more printers and sell them if you want. Which came first, the chicken or the egg, or the 3D printer or the 3D printer? At the time I was thinking about ways to make TV and movie props from CAD designs. I wasn’t thinking big enough apparently. In fact, between last June and last Fall I caught a re-run on the Science Channel of an episode of TV series Science at the Movies hosted by Nar Williams. 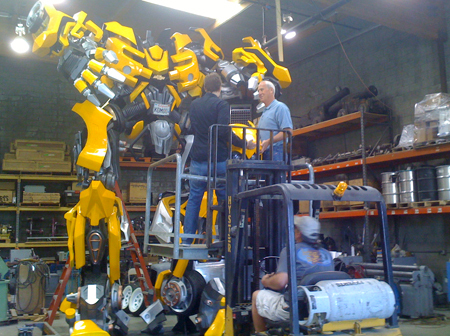 Williams introduced us to Fxperts, Inc., a prop house for Hollywood flicks building a larger than life Bumblebee Transformer for one of the Transformers movies, beginning with converting digital designs to three dimensions via printing technologies. So Hollywood was already using this technology on a big scale, at least for some cutting edge (aka expensive) projects like this big budget summer blockbuster. But how can static 3D printed creations help human science? You can print any static three dimensional project with even bigger and better printers. But what about non-static objects? The EMDT article discusses the rapid creation and deployment of technologies that can quicken research by creating 3D prototypes to beta test procedures, such as a mock surgery before an actual surgery using a fully mapped 3D replica of the area of the patient needing the procedure. Using “additive engineering”–basically advanced printing methods of what the folks at Maker Faire were demonstrating last year–a company is using 3D printing for “tissue engineering.” The German company, envisionTEC GmbH, has developed a machine that can print soft tissues, the 3-D Bioplotter. As quoted by EMDT, “The 3D-Bioplotter can process high-temperature polymer melts and ceramic materials for bone regeneration, as well as silicones for surgical restoration and finally very soft hydrogels for soft tissue regeneration, as well as organ printing,” said envisionTEC GmbH Dipl. Chemist Carlos Carvalho. A printer used to print a biological heart. 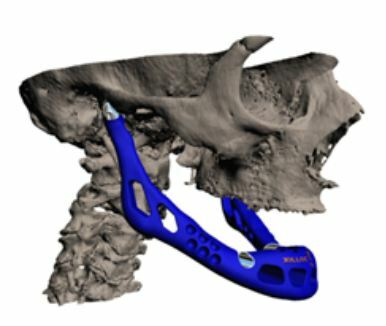 The Orthotec.com article refers to a real-world successful implant last June of a 3D printed titanium lower jawbone, which completely replaced a bone damaged by infection in an adult woman. That woman could speak again and use the jaw within hours of the operation. The implant was created under the direction of Jules Poukens, MD, a craniomaxillofacial surgeon at University Hospital Maastricht in the Netherlands, and a team of researchers and surgeons from Belgium and the Netherlands. Do you want to know more? Check out this video where Dr. Atala prints organs. That’s right. Prints organs. Consider that 90% of people on organ donor wait lists need a kidney transplant. Incredible stuff, and another step towards implementing borg technology in real life. Thanks to Susan Fourtané for connecting the dots for us.